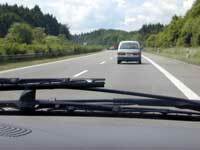 After a leisurely morning, we headed down the autobahn for Switzerland. The drive was largely uneventful. There was a bit of rain at one point and some construction delays at a few points. 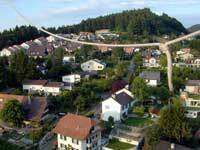 At about 1:00 p.m., we crossed the Swiss-German border between Singen and Schaffhausen. While Alf, Watcharee, Mike and Dan were shooed through the checkpoint by the officials, Annie, Cindy, Jez and I were pulled over for a bit more scrutiny. No arrests were made, however, and we were soon on our way again. We made a couple of short stops to refuel and check out the always interesting items available for sale at roadside gas stations, and sooner than we expected, we were approaching Bern. This was quite a pleasant surprise. We have been spending a lot of time on the road during this trip, and now we would be settled at one location for the duration. More than that, it appeared that we would be able to have a balloon flight tonight, which we had not expected to be a possibility. We checked in at the Bellevue Palace. Our rooms here are extremely nice. While accommodations have been excellent throughout this trip, the Bellevue Palace is a world-class hotel, and it is always fun to have the bathrobe and slippers and everything else. I do think the heated floor in the bathrooms could be turned down a few degrees, however: I rather like my underfoot marble to be a bit on the cool side. After sitting around the hotel for an hour or two (and, in my case, running across the street for a power adapter and a couple of Herald Tribunes), we climbed back into our trusty Previas and drove to our launch site. We had a wonderful flight. This area of Switzerland is so beautiful, with its green hills and valleys, its lazily curious cows, and a remarkable number of cats running around in fields. We waved at a lot of local residents, and we oohed and aahed at the marvelous scenery. The faint sound of cowbells clanging provided a peaceful soundtrack. Our landing was a bit more eventful than usual. As darkness fell, we found ourselves in an area that didn't really have much open space. Meanwhile, the chase crew found itself in an area that didn't have any roads that led directly to us. We hovered and evaluated possible sites while the chase crew tore through the Swiss countryside trying to reach us. They ultimately arrived, and we began a dance of drifting up the hills to a possible landing spot, then sliding back down to another one, as the chase vehicles took roundabout paths to stay with us. Although space was very tight, we eventually set down on the edge of a fairly busy road. With the Screwmaids towering overhead, traffic was temporarily brought to a halt in both directions. The crew maneuvered the basket onto its trailer, and as the envelope drained its air, they carefully lay it between the pavement and the power lines: a tight fit, I might add. By this time it was late, and our restaurant options were basically non-existent. We decided it was a good night for relaxing with some room service (and, in my case at least, email and CNN). 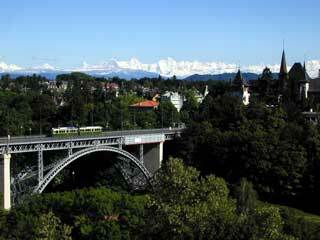 The morning would not come too early tomorrow: We planned a "free day," with shopping and strolling around Bern at our own pace the primary order of the day. The girls planned a search for shoes; Alf and I dreamed of obscure computer accessories. With Bern's extensive supply of interesting shops, all of our whims are likely to be satisfied. You can have it all this month: travel, culture, money ... even long-distance romance. You might want to update your passport in preparation for a mystery pleasure tour. You are intensely alive and feeling a bit bewitched, which attaches you spiritually to sacred places and charismatic teachers. Listen closely, because mentors have much to offer. A magnetic stranger seems unbearably potent and exciting. FYI: Look before leaping across boundaries that might change your life forever. As planned, this day began in a most leisurely fashion and it continued so for quite a while. At about 10:30, the first few of us ventured out into Bern. Cindy and Watcharee shopped for shoes and other miscellany; Alf and I walked through quite a bit of the city before settling in at a photo shop for some serious browsing. Although we were intrigued by old Leicas and digital Canons, our actual purchases were limited to a Compact Flash adapter and a few tiny tripods. Lunch was a moules et frites extravaganza, reminiscent of Les Marinieres in Beaune. Cindy, Annie, Watcharee, Jez and I worked our way through huge vats of the little shellfish as the rain began to fall outside and the sparrows walked around us. When it was over, Jez went to find film, Annie and Cindy had undisclosed shopping missions, and Watcharee and I returned to the Bellevue Palace. While I did various computer-oriented tasks, others took naps. At 18:00, the skies looked quite unstable, and our amateur opinions were all in the "flight is unlikely" camp. Of course, we need an official word from Mike before we'll know for sure, but I'm guessing it will be a quiet evening. Perhaps there will be time to catch up on a little reading and a lot of sleeping. It's good that we had that unexpected flight last night! Our amateur predictions on flyability proved to be correct. The weather was simply not appropriate for ballooning. So we all simply decided to spend the night in the hotel. Cindy's room was the headquarters for manicures and various other spa-like activities ... and then, a bit before 10:00 p.m., the Pizza Hut a block away made a delivery. We spread everything out on Cindy's bed and had dinner. The Bellevue Palace seemed to be a bit taken aback at our receiving a pizza delivery here, in their five-star establishment with several excellent restaurants ... but that's just the way we are sometimes. Bedtime came earlier than any previous night. I spent a little time watching a BBC program on the age of rocks and fossils, and then I was asleep before midnight. I had coffee delivered at 08:00, and Cindy and I went downstairs at 09:30 for an investigation of the Bellevue Palace's breakfast buffet. I thought I remembered smoked salmon from my previous visit here in 1997 ... but they didn't have any set out this morning. There was some rolled herring, stuffed with pickles, but for some reason I wasn't in a herring mood. A brief spell of patriotism hit me, and I had a traditional American artery-clogging meal of bacon and eggs. 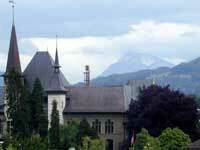 At noon we met the crew and the Previas downstairs and we headed down the road to Thun. 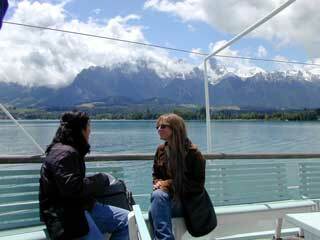 There, we boarded the Blümlisalp paddle-boat for a voyage to Interlaken on the Thunsee. The morning had been quite rainy, but the weather shaped up considerably for our boat ride. As we pulled out of Thun, there were large patches of blue sky, and the mountains were looking quite lovely. By the time we headed to a lower deck for lunch, it was clouding up again, but that worked perfectly with a roof over our heads. We were smart to go downstairs when we did. 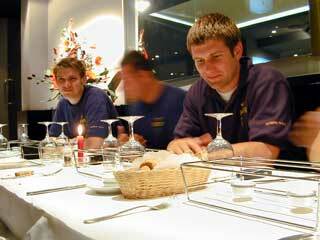 Often on this boat ride, lunch is ordered too late, and there's no time to eat before the arrival in Interlaken. Indeed, that pretty much happened last time I was on this boat, in 1997. This time it turned out fine ... even though our waiter had some serious difficulties filling our order correctly, and so we used up much more time than we would have expected. The Blümlisalp is a pretty cool boat. It is in absolute mint condition, although it's almost 100 years old. 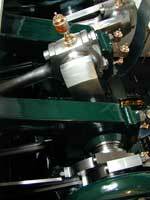 The immaculate 1906 engine's large pistons sparkle. The Previas were waiting for us when we arrived in Interlaken, and after toying with the idea of browsing through some of that town's plentiful tourist shops, we decided simply to head back to Bern. Tonight's weather remained very iffy in appearance. Mike's research indicated that the approaching weather was only going to make things worse. Tomorrow morning looked considerably more promising, however ... so it looked like "early to bed and early to rise" would be the best way to go. 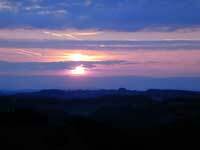 Sunrise here is slated for 05:39 ... only a few minutes later than Germany, and still pretty early. It would be best not to stay up into the wee hours tonight. Due to popular demand, a return visit to the moules restaurant was the plan for dinner. The entire crew joined us, so there were a dozen of us munching on the little shellfish. During the course of our stay here, we must have depleted the mussel population by about a thousand. We returned to the hotel at about 23:30, only to discover that Cindy and Annie's doors no longer opened at the behest of their keycards. We had a number of possible explanations for why the Bellevue Palace might have revoked their guest privileges — there's no reason to go into those details here — but we decided to play it straight with the management, and we innocently asked for assistance in prising open the doors. Annie's portal succumbed to the master key card in the hands of the master key card person, but Cindy's remained intransigent. Finally, after the master key card person slunk away in ignominious failure, the Grand Exalted Master Key Card Wizard showed up, and with a learned twist of the wrist he was able to deliver Cindy to her bed. 1874: French opera singer Marie Thible became the first woman to fly. Accompanied by a pilot, Thible sang an aria from a balloon as it flew over Lyons, France. It's yet another holiday in Europe! We arrived eleven days ago on Thursday, the Feast Day of the Ascension; today is Pentecost Monday, when the descent of the Holy Spirit 50 days after Easter is celebrated. While no shops are closed in the United States on these days, they appear to be quite a big deal over here. Needless to say, these holidays' themes of ascent at the beginning of our trip and descent at the end fit most appropriately into the arc of our trip. It's an absolutely beautiful day in Bern, and we had a breathtaking flight this morning. Bern has never looked more lovely. Tonight we will have our final dinner; tomorrow we head for Zurich and our respective airplanes back to the United States.